Welcome to the Coast of Maine, Classic efficiency , One Bedroom Maine Cottage near Pemaquid Lighthouse and craggy shore: tidy, compact cottage with versatile trundle bed, double sofa bed, kitchenette includes fridge,stove, sink; other features include shower only bathroom with sink, toilet, includes towels. Bedroom includes linens, small bureau, nightstand/lamp, versatile trundle beds, Kitchen includes pots/pans, plates, toaster, toaster oven,glasses, coffee maker and fold up kitchen table with chairs; Living room features a sofa(double pull out),vaulted ceiling, light fixtures, front porch includes cafe table for morning coffee; outdoor seating in 2 adirondack chairs by the vintage garden, picnic table, fire pit, window boxes bursting with blooms; Located at tip of Pemaquid Penninsula within minutes to attractions: lighthouse, museum, farm stands with fresh veggies, restaurants, antiques, kayaking, beach and majestic views of ocean, spectacular shots of crimson sunsets, risin sun, catch a glimpse of seals frolicking on rocks. Affordable, efficiency size cottage with a real get away feeling. Enjoy lobster, clams, Maine Blueberries, at Pemaquid Beach feel the fine sand, smell of the salty ocean and search for shells as you walk the shore. Versatile bedroom includes trundle bed which can be used as two twins or together as you wish. Amenities include: iron, hairdryer, picnic basket. . Kitchen icludes fridge, toaster, stove, pots/pans, plates/cups, coffee maker, spices. Listen to music or weather reports from the built in stereo and speaker. Front porch overlooks vintage garden, flower boxes and provides a spot to enjoy an early morning cup of coffee. Living room includes a pullout couch and gate-leg kitchen table with four chairs, bench used as coffee table. Plenty of blankets for those great sleeping nights. Keep an eye out for deer and her two babies, moose, fox, groundhogs,eagles and ospreys as you explore the Point. Clear nights provide fabulous star watching. Outside seating and picnic table for relaxing. Local grocery store ,Reilly's has it all...paper, deli, pizza, meats, milk and bread to name a few. Short walk down private right of way, dirt road is perfect viewing spot of John's Bay and Islands Explorte tide pools, swim or fish from the rocks or just relax on the lawn at the bench. The days seem to go by too quickly. Follow the scenic Bristol Road almost to the end to find the cottage...a true gem! Cottage is comfortable for two people. A wonderful technology getaway vacation. Hardy Boat Cruises: See Maine by sea and smell the salt air and cool breeze on your face. Puffin Watch, Seal Watch and Sunset Light House Cruiseand Great day-trip to Monhegan Island is a must on this visit to the Maine coast. Wear comfortable foot gear. and enjoy lunch or dinner at Shaw's Restaurant on the pier at New Harbor when you return back to shore. On Monhegan Island bring a picnic, back pack in closet for hikers, Hike to cliffs on far side of Island. Artist galleries open by chance in village. Lighthouse Museum interesting and worth poking around to see local lore of the sea. You can buy pizza/drink on Island. In May/September Bird Migration Is TOPS! Bring Binoculars,trail guides provided by Hardy Boat, wear good walking shoes paths only no paved roads....a throw back in time....On a trip during the summer one renter saw whales, porpoises, seals, variety of birds and was especially delighted with trip. Fort William Henry: Fabulous must see spot....for the historian in you of colonial life in Northern New England.Early settlement provided Cod for Europeans in 1600's made this an important British claim. Museum is rich with artifacts and short 15 minute movie of Pemaquid settlement. Fort sports a self guided tour of settlement gives an idea of how daily life was conducted. Monday night Historical Lectures Series, Special events and lantern tours. Pirate Dixie Bull once raided the settlement, hurricane sunk the Angel Gabriel, Native Americans/French traded and fought with British. Maine TV crews had been filming Maine Archeologist at dig this past summer Archeologists still working at the dig. Picnic basket, blanket and a bottle of wine included at cottage. Handicap accessible with picnic benches and panoramic view of Pemaquid Harbor. Order a lunch from Riley's Market at the Deli section or from The Cupboard Restaurant on the Huddle Road. I am a special Needs Teacher from Boston area. My daughters spent their childhood summers at the cottage. One daughter works for Community Cocepts in Lewiston, ME and has a passion for sailing out of Round Pond.Another daughter works at Boston Medical Center and loves to kayak. I love to garden and walk to the Lighthouse during the summer months to watch sunrise. I love finding Antiques, sitting on the beach for hours or on the rocks watching the waves roll in. I look forward to returning to another season. Time away from the tv affords me the luxury of reading , being outdoors, refinishing furniture, cooking and working in my garden. Since I was a freshman in college I have been traveling to this location. I came to Maine to visit a friend I grew up with and never wanted to leave. My daughters are grown and continue to come back to experience the delights from their childhoods; swimming, sailing, kayaking. We never ever had a tv and learned quickly that Maine meant time for them to develop their creativity and enjoyment of the outdoors. Reading the night stars, painting flowers in bloom, tending the garden and snorkling are still favorites. Maine affords me time to find treasures at local antique shops or flea markets, watch the sun rise at the Lighthouse, time to make whoppie pies, volunteer at the Fort Gift Shop. Most especially are the quiet rides on the Pemaqud River by Kayak and french fries at Pemaquid Beach. Every corner one turns is eye candy. You must come to see it! Just beautiful. Lobster has never been so fresh. Under the canopy of trees the gardens bloom throughout all the seasons. My favorite are the wildflowers that peak out as the last of the snow melts. Mainers enjoy eating the fiddleheads that can be found in early spring . This time of year also brings the peepers who croak during the early evenings (Bullfrogs). So many warblers migrate through that it is hard to distingush them all during the spring. sandy beach is 3 miles from cottage. Go to the beach: Beach blanket, picnic basket, Head to the Tide pools; fishing pole and tackle box, Great Bird watching; bird feeders, bird boxes, two Adirondack chairs on lawn by garden. Pemaquid Lighthouse a short walk away...climb up the tower (see schedule at Light house) Lobsters at every corner, Dining a short walk away at Seagull Shop or Bradley Inn Cottage evenings, include brilliant sunsets at bench, good lighting for reading or playing cards Artists have enjoyed painting surrounding area...Pemaquid Hotel has special artist seminars (see Hotels summ Bring favorite cassette tapes for available stereo Kitchen table ...gateleg table which opens to feed eight people or big enough to lay out your canvas to dry Loop Road one mile walk from front door of cottage...breathtaking views, sunsets and moon rises, or Seagull Shop for Blueberry Muffin/coffee, Lighthouse Tower open Weds. and Sundays to public Cards, umbrella, crab a nator in closet. Arrived in a October twilight downpour, to this clean, cozy cottage. No problem finding it since it 's on the main road, pretty quiet at this time of year which was fine with us. NIce yard and outdoor spaces. Short stroll to a lovely ocean view . Found most everything we needed as promised (no lobster tools). Definitely not a place for more than two people as trundle bed was sort of challenging. We enjoyed our stay. A nice little piece of home away from home. The property is quaint and amenable. Quiet, peaceful, pretty with all the necessities for basic needs with a personal touch are available here. WiFi was not found. The trundle bed was a challenge at first, but once assembled, it was surprisingly comfortable. The location seemed advantageous to the local points of interest. The fridge was sporadically noisy, but nothing that couldn’t be ignored. Thank you to the owners for their care and attention to making our stay away so welcome. Adorable cottage in a great location! Very good for a couple or single get away. Fun gardens to stroll through and view of harbor at end of road was beautiful. Everything we needed and convenient to many tourist areas. So charming! Just the right size for two of us. Janet thought of all the little details, from extra tea bags to a bag of marshmallows! The Old Post Office is a charming rental. A bedroom, full bath and a combination full kitchen/living/dining room. Size of spaces inside may be a little tight for a family but it was perfect for the two of us or a couple with a child. Janet's thoughtful touches are everywhere inside and also outside with a beautiful yard. She is a good hostess! It's very centrally located on Pemaquid with easy access to many of the places we wanted to see. Thank you Janet! 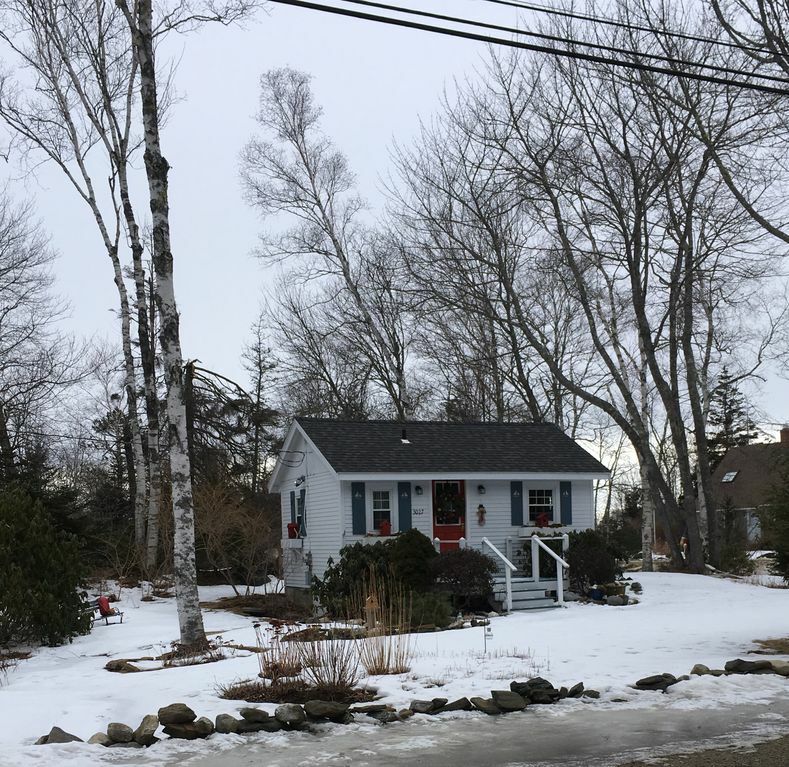 Enjoy spring in New England, Stand at nearby Pemaquid Lighthouse delight in the fabulous views of the majestic blue ocean and islands, Cottage Gardens burst as the day get warmer. Restful Retreat/Romantic two room cozy, clean, comfortable cottage at Pemaquid Point Peninsula breathtaking walks around point.... Stroll to Pemaquid Lighthouse to make sure the light is on at night or visit during the day and climb the spiral staircase to top to watch lobster boats, visit Fisherman's Museum ,art galleries, visit Seagull Shop Restaurant delight in a warm breakfast with a view or pack a picnic, binoculars and spend the day at Bristol Lighthouse Park and sandy crescent shaped beach, comb waters edge for sea glass. Nearby grab a cooked lobster or clams for lunch or dinner, history awaits at Fort William Henry historic sight with an museum of archeological treasures and gift shop. Take a ride on the Hardy Boat to see seals/Puffins or a day trip to Monhegan Island. At LaVerna Preserve catch glimpses of an eagles, seals, ducks and cliff side trail. Rent a kayak and explore the coast, golf or fish in nearby Pemaquid River. Antique shops abound. Damariiscotta center offers a real old fashion soda fountain at the local drug store wonderful coffee frappes and fresh fish market, Bookstore, Shops. You will be inspired to capture the view so bring that camera or sketch pad. A must is the Maine Botanical Gardens in Boothbay...quite unbeleivable rain or shine.Enjoy crisp, clear skies, Clark Cove Apple Orchard for apples blossoms, glimpses of eagles/ospreys dashing for alewives in the spring and spend the day watching the boats sail by lighthouse. Summertime enjoy Lantern walks at night at Old Fort Henry, fireworks/parade at Old Bristol Days, Lobster Boat Races and Sand Castle Contests make this a charming, must see location. Other Activities: bird watching...bird migration is currently on sight so many different types of of warblers, song birds, Hawks, sea ducks.